I often describe Jackson, Mississippi as a “big small town” or a “small big town”. Either description will do because this city features the best of both. At 174,000 people Jackson is slightly smaller than Little Rock and doesn’t even come close to cities like Memphis or Atlanta. So it has a small town feel. There’s still a good chance you may to run into someone who knows someone who knows you. Yet, Jackson is the largest city in the state, and it’s the state capitol which means there’s always something happening in this busy city. I’m constantly surprised at how this relatively small town can do things in a big way. On parade day, Saturday, March 16, the sun gleamed happily, suspended in an endless blue expanse of sky. My wife and toddler son packed into the car about about an hour and a half early so we could park. Finding a spot downtown only cost us $5 bucks. Yet another perk of living in the 3rd most affordable city in America. God gave us one of those perfect days when the temperature is just right–not too hot, not too cold. After we walked up and down about a mile of city streets to spot a good location we hadn’t even worked up a sweat. We ended up on a shady patch of grass right in front of an historic Episcopal church. The church was having its own St. Patrick’s Day celebration, and one of their members also works with my wife so we got to share some of their prime real estate. Even though we had been to the parade last year, we only went to the kids parade and the pet parade. Yes. The pet parade. People dress up their pets in St. Patrick’s Day gear and…well, parade their pets down the street. But this year we went to the “grown-up” parade. I thought a parade for adults on St. Patrick’s day might be a bit too much. I expected green beer sloshing over the sides of plastic cups as revelers stumbled up and down the sidewalks. I wouldn’t have been surprised to see mostly naked people wearing green wigs and roller skates. I would have expected scores of cops listening intently to their radios with their eyes bouncing up and down the streets for trouble. But the St. Patrick’s Day crowd was tame by parade standards. Of course, young girls seemed to compete for who could wear the shortest shorts. The floats passing by certainly didn’t play the edited version of the music they blasted from over-sized speakers. And as the day wore on you could see alcohol was starting to have its effect in the glassy, red-rimmed eyes and flushed faces of the carousers. But I’ve been to parades in New Orleans, Chicago, and New York City and the St. Paddy’s Parade in Jackson was family-friendly by comparison. As an alum of a school whose mascot is the “Fightin’ Irish” I’ve been to my share of St. Patrick’s Day parades. But I’ve never seen so many Black people at one. St. Patrick’s Day is not a huge holiday in African American communities. Most Blacks aren’t Catholic or Irish, so it really just turns out to be a day to wear green or put green dye in foods and drinks. But since Jackson is 80% African American a large contingent of Black folks is almost inevitable. I simply felt freer to engage in the celebration seeing people who looked like me and were as excited about the parade as I was. 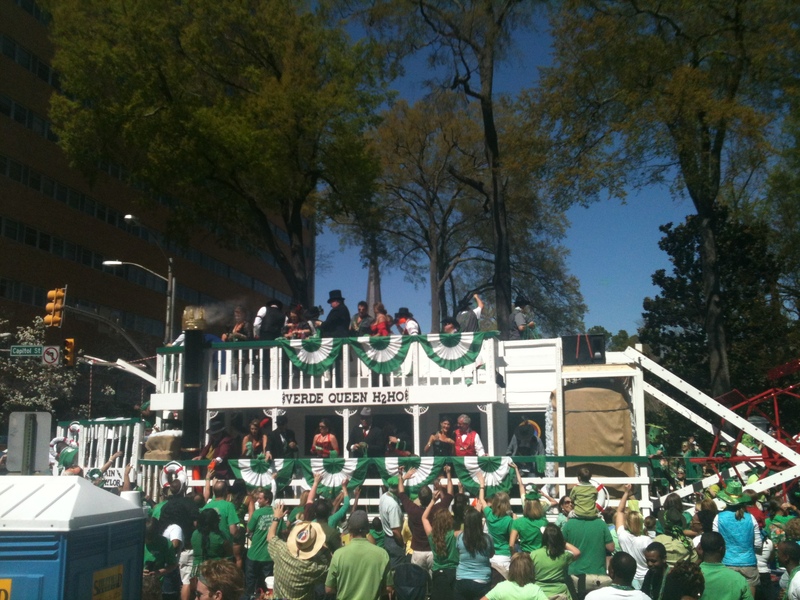 If you’ve never been to the Mal’s St. Paddy’s Parade, I think what will impress you most is the excellence execution of the event. You wouldn’t expect a big small town to have a parade with literally thousands of people lined up along the sidewalks. You wouldn’t anticipate the energy of the crowd and more and more people congregated for the start of the parade. You couldn’t predict creativity and abandon exhibited in all the floats and costumes. In short, it was an awesome parade. And little ‘ol Jackson pulled it off. I’ve lived in several places during my adult life, but never has a city so immediately captivated me like Jackson. 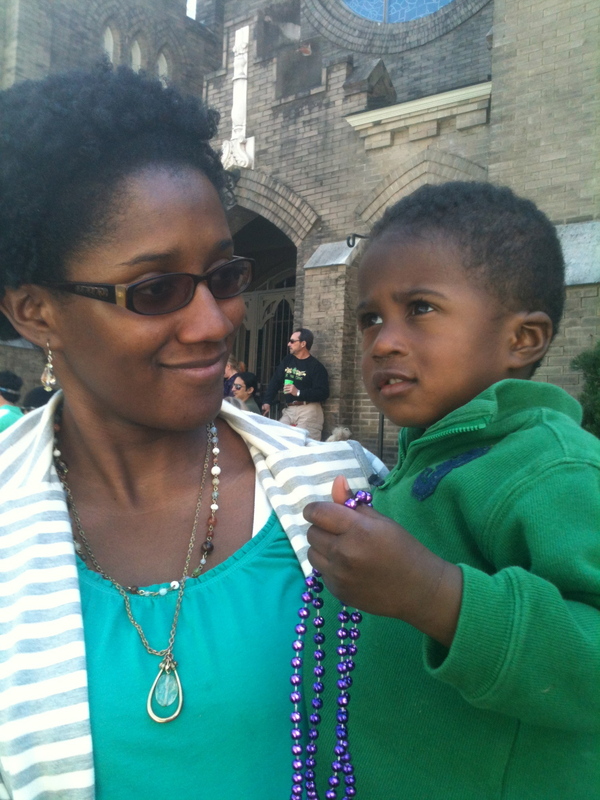 The St. Paddy’s celebration is just one float passing by in a long parade of culturally rich experiences Jackson has to offer (read about my tour of Tougaloo College, for instance). Because of it’s location in the Bible Belt South and the relatively small population compared to other cities Jackson may not be first on your list of tourist spots to visit. But if you make Jackson one of your destinations, I’m sure you’ll be as charmed by this big small town or small big town as I am.